Based upon the net interests shown in Lynden Energy Corp.’s (LVL) Annual Report, LVL has between 3,700 and 3,850 net acres. 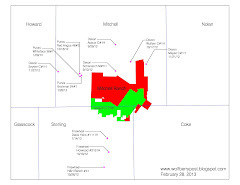 At 80 acres spacing, LVL could have around 47 net wells in the Wolfberry play from their current inventory of land. If the spacing is decreased, LVL could have even more wells. LVL has seized a unique opportunity to exploit the Wolfberry oil play. They are a small company with a land position in the hottest oil play in the U.S. and can attract serious market attention in a hurry!